Yummy, Low Calorie Diet Food -- Plus Where to Buy! : Just Blueberries! Just Bananas! Just Tomatoes! Just Blueberries! Just Bananas! Just Tomatoes! 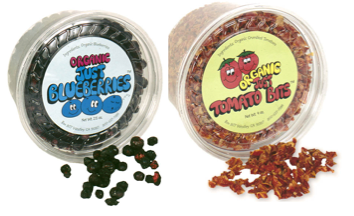 A company called "Just Tomatoes" makes delicious little two-ish serving tubs of dried fruits and vegetables, with no added ingredients (so in the case of Just Blueberries, the only ingredient is blueberries). I've actually been eating fruits and veggies out of these little tubs for many years now! You can buy little tubs of dried apples, bananas, apricots, blueberries, blackberries, cherries, carrots, corn, peas, green onions, amongst other fruits and vegetables. As you know fruit (especially dark fruits like blueberries and blackberries) is full of healthy antioxidants that help protect our bodies from things we don't like such as aging, heart disease, neurological disease, diabetes, and cancer. The dried fruit and vegetable pieces are great toppings for your low calorie oatmeal, fage or other yogurts, to eat with almond milk (almond milk makes dried fruit taste really sweet! ), or to snack on dry throughout the day at work (I keep a tub of Just Bananas in my desk so I can reach for dried bananas rather than the other kinds of snacks available in the workplace). In terms of calories, they vary based on which fruit or vegetable you buy (overall they vary from about 1-3 weight watchers points per serving). The just blueberries are 100 calories per 28 gram serving, with .5 grams of fat, and 2 grams of fiber (so 2 weight watchers points), and the tomatoes are 80 calories, 1 gram of fat, and 2 grams of fiber (also 2 weight watchers points). You can buy them at Whole Foods! How do you eat your dried fruit? Funny thing, I was on a forum last week asking if dried fruit was a good thing to delve into and try. One response was yes, but watch the extra calories from added sugar. It's good to know I can get a "just fruit" alternative with this product. Now I've got to track these things down. That's the hard part! I've heard of these; they look good! I love eating dried fruit just plain or mixed in yogurt is another good way! Ya know, I've seen these in my market but have never tried them. Sounds like the blueberries would be a welcome addition to my morning yogurt concoction! I have been on their website https://www.justtomatoes.com/ once when I was looking to buy freeze-dried fruits. Unfortunately they do not ship overseas, but they sound great! I thought the are all freeze-dried, and freeze drying makes them crunchier than just dehydrating! They also sell powdered fruit which is amazing for dessert making! hmm are they packed full of flavor? I love dried fruits. Raisins are my favorite. I add them to my oatmeal instead of honey or other sweeteners. fun products! I'd love to try those dry veggieS! :D Did u get it in WF? My favorite dried fruit is apricots. I like to eat them with a few raw almonds and a little piece of dark chocolate. Love them on cereal, ice cream and my oats. Oops - yep, I got them at WF! I love this idea! I'm more of a fresh fruit person but I do love dried raisins and also figs. I've never had dried blueberries before! Had my first trip to an organic store this weekend and I found these without even looking. Too bad I was too chicken pick 'em up and try them. Maybe the next trip. I eat my dried fruit all by itself-mmmmmmmmm. I love "Just Veggies" by the same company too-delicious dehydrated mixed veg. a perfect crunchy snack! the only thing that confuses me is why they have fat in them if it's only the fruit..
i mean, nutrition labels have never showed blueberries or tomatoes having fat in them..